Don't You Wish you Were Made of Carbon? 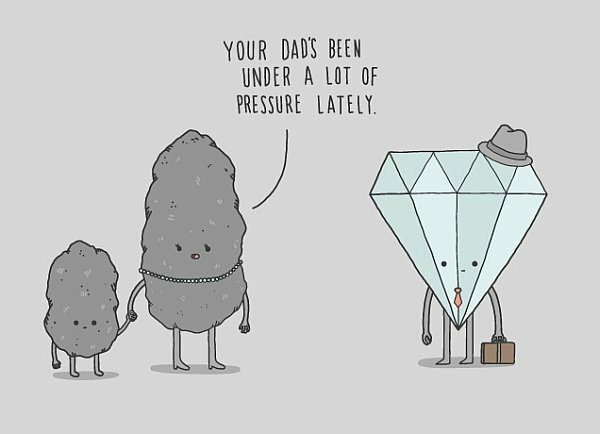 This cute comic makes us wish that we were made of Carbon because when we are under a lot of pressure, we definitely don’t become this pretty! Here’s a little background to this comic. Diamonds are actually made up of carbon that after millions of years of being under a lot of pressure at high temperatures turn into something that we know these days as a Diamond. Coal contains a lot of carbon so the little coal daddy, after being under a lot of pressure at work, turned into a diamond. Get it? It’s cute!